Welcome to Day 3 of Pumpkin Week! Are you enjoying it so far? We’ve covered muffins, bars and today we’re making cinnamon rolls with a pumpkin twist! You can also check out Pumpkin Week Day 4, Day 5, Day 6 and Day 7 by clicking on each day. I love having cinnamon rolls for Thanksgiving morning and Christmas morning. There’s just something about them that yells special, festive breakfast around here. Maybe it’s because those are usually the only times I make cinnamon rolls. 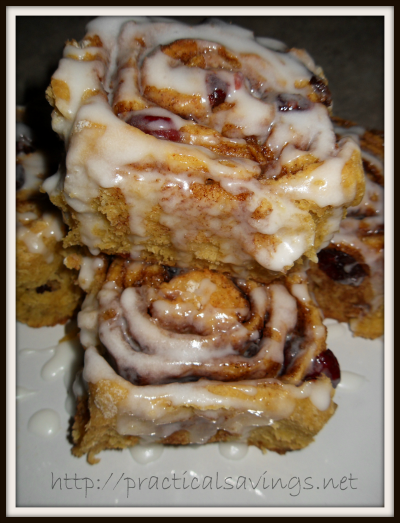 Anyhow, they’re a real treat around here and we love these pumpkin flavored rolls especially. I personally like to double batches around here because they can go fast and if I’m going to put the work into making them from the start, I might as well make enough to freeze or have for another day. Kitchen Tip: Besides making your own pumpkin puree, don’t forget that you can make your own brown sugar if you run out. No point in heading to the store if you have the ingredients on hand. Do you have a holiday breakfast tradition? Share it in the comments below. I’d love to hear about them. *Adjust the amount of water according to the time of year or your climate. For summer, or if in a humid area, use the lesser amount of water. In the winter or a dry climate, use the greater amount of water. Mix together all the dough ingredients. Knead by hand, mixer or a bread machine until the dough is soft and smooth. Place dough in a lightly greased bowl, cover and let dough rise for approx. 1-1/2 hours or until doubled. Turn dough onto a lightly floured surface. Roll into a 14x22 rectangle. Brush dough with softened butter and sprinkle filling mixture. Add dried cranberries. Roll dough carefully into a log. Cut the log into 1-1/2" thick rolls. Place the rolls in a lightly greased pan. Cover and let rise for 1 hour or until rolls look puffy. Preheat oven to 375. Bake rolls for approx. 25 minutes or until lightly browned. Remove from oven and cool on rack. Make glaze while rolls are cooling. Remove rolls from pan and drizzle with glaze. Follow Practical Savings’s board Holiday Foods on Pinterest.